Several years ago when I read Geraldine Brooks' novel Year of Wonders and realized that the village the book describes is real, I knew I wanted to visit there. This past March, Denis and I hopped in the rental car and made our way into the heart of Derbyshire and the Peak District to Eyam (rhymes with "team"), the Plague Village. To make a long story short, a plague-infected bolt of cloth made its way to Eyam, and when people began to get sick, the villagers decided to do an extraordinary thing: they quarantined themselves and the village from the rest of the world in hopes that the deadly disease would not spread. Many of the villagers died. As Denis and I made the turn from a major road onto the secondary one that would take us to the village, I began to feel as if time were flowing backwards. 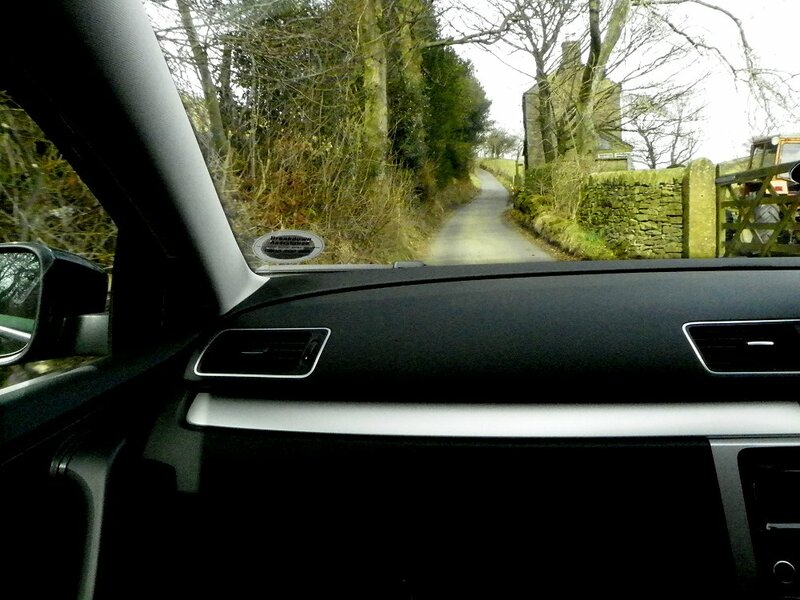 The secondary road was narrow and wound through hills and thick patches of trees. The further we went, I could see that-- at least from this direction-- it would be fairly simple to post a guard or two to prevent others from going on to the village. 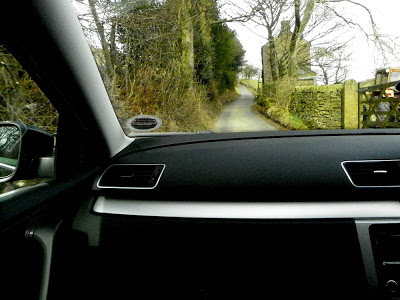 The ancient narrow streets of Eyam were tricky to navigate with all the cars parked along the side, but Denis easily found the way to the large parking lot at the top of a hill. This was a good parking lot indeed because there was a large building housing public restrooms right on site. Following the travel advice of a dear friend ("Never pass up the opportunity to pee") we checked out the restrooms, and then headed on into the village. As usual, the sky was a leaden grey, and the knife-edged wind was blowing straight from Russia. 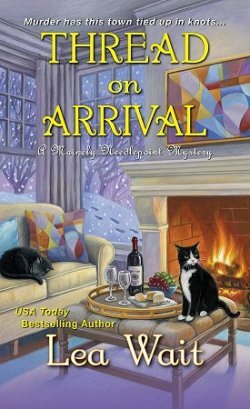 I turned up my coat collar, hunched my shoulders, and followed Denis. 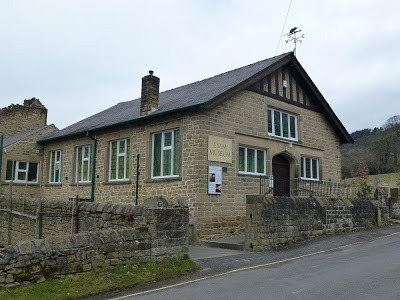 The first building was right across the road from the parking lot: the Eyam Museum. 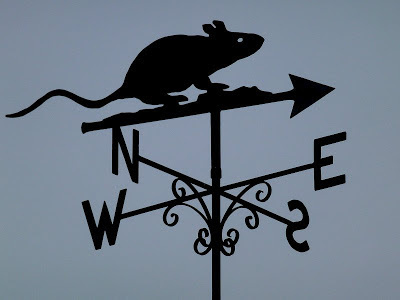 One of the first things we noticed about the museum was its weathervane, a Millennium gift from the Eyam Village Society. With its history, the weathervane is rather fitting, don't you think? 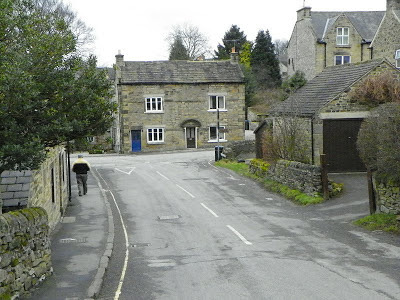 Denis doesn't have two bad knees that try to lock up in freezing cold, so as I carefully made my way down the steep street (yes, Eyam is built on hills), the most I got to see of my beloved was his back for this part of our sightseeing. And of course there were other reasons why I was being a slowpoke-- like stopping to photograph houses all made of local stone. 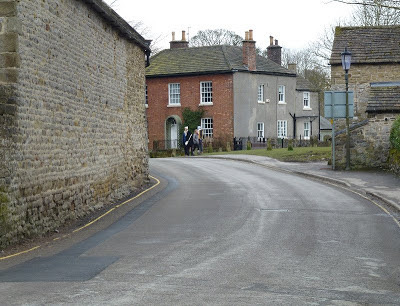 One of the things that always amuses me is that, in so many of the ancient villages of England, the front doors of the houses open right out onto the street. I've always been afraid that this American would forget one day, open the door, and walk right out into the path of a car. Yikes! 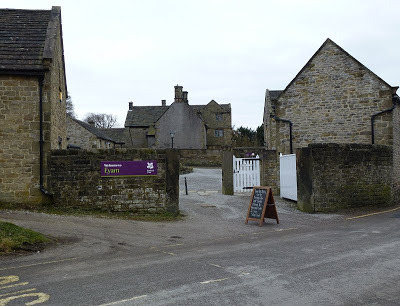 In no time at all, at least to this particular nosy parker, it seemed that we rounded a corner and were looking right at the back courtyard of Eyam Hall. The National Trust banners threw me for a loop because all of the reading I'd done on the place said nothing about the Trust. 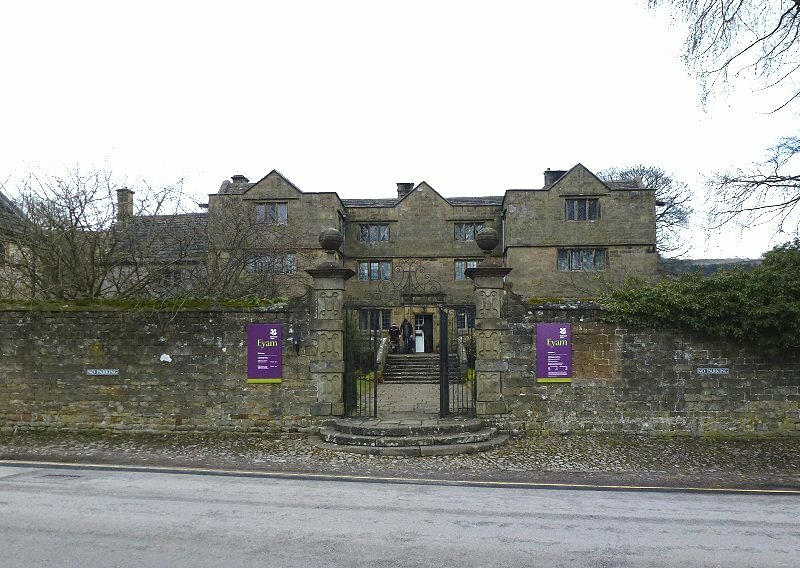 When we went inside the Hall, we discovered that this was the very first day that Eyam Hall was open as a National Trust property. To the left, Eyam Hall. To the right, a nice-looking home called The Brick House because it's the only building in Eyam that's made of brick instead of the local stone. It was formerly the Stag Inn and is right across the street from the front of Eyam Hall. Take a look and see if you have the same problem I do with the house being called The Brick House! 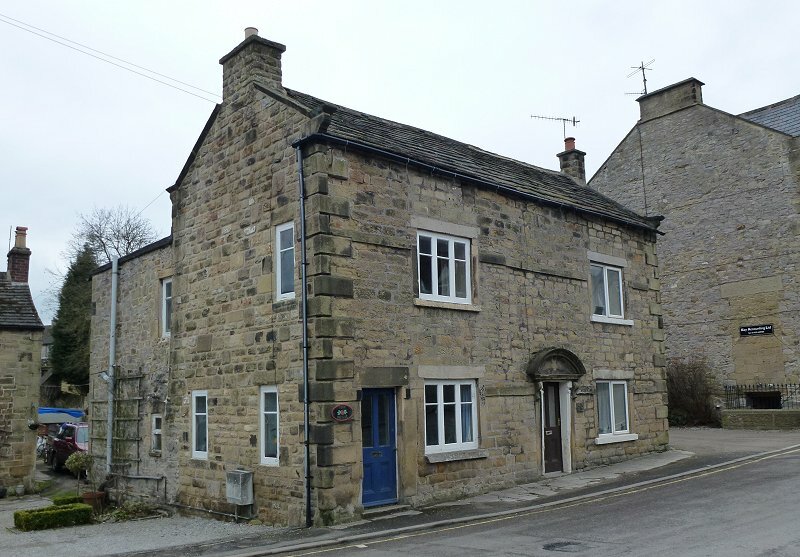 With that stone wall surrounding it and just from its overall appearance, Eyam Hall looks more like an asylum than a family home, but let's take a look inside! Upstairs Downstairs or Downton Abbey, anyone? Right across the street from the Hall is the Brick House and a small open area where, in centuries past, farmers' wives would bring fresh produce to sell. It's also where the stocks are for any of the village miscreants. 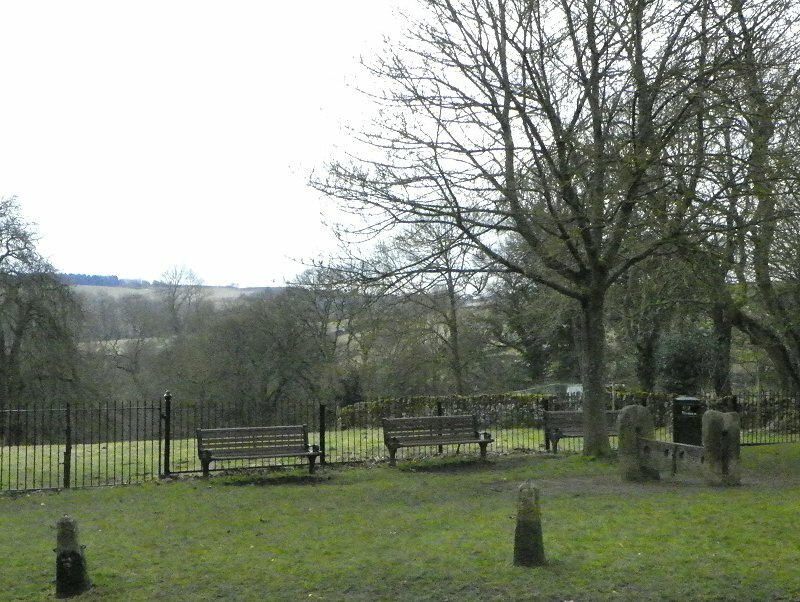 I wonder if they had benches centuries ago, too, so villagers could sit at their leisure and pelt those in the stocks with leftover fruit and veg? See the two benches with the stocks to the right? 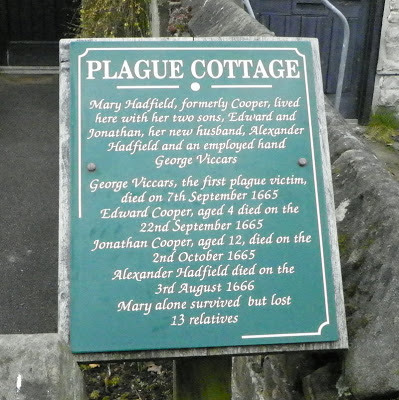 Not far down the street from Eyam Hall were the plague cottages, each one neatly signed. 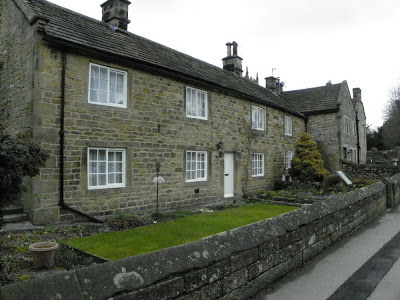 For having so much history occurring within their walls, these cottages look so... commonplace, don't they? And if you're wondering why I'm not showing more photos of them, it's for a very good reason. These cottages are being lived in today, so there was no way on earth I was going to knock on a door or try to zoom in for a look inside a window! Just past the plague cottages was St. Lawrence's Church (formerly St. Helen's). When we'd finally had our fill of the bone-chilling cold, we began to walk back through the village, and the sight of all the satellite dishes on the sides of centuries-old cottages made me smile. 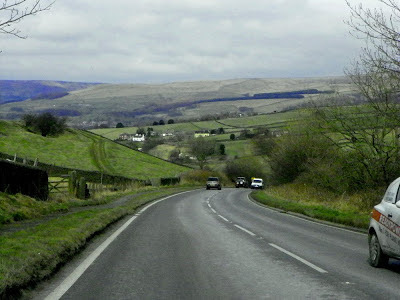 On the way back to our cottage on the Lancashire/Yorkshire border, we took a wrong turn. Denis let his GPS choose the way to get back on track, and it was an interesting route. Fortunately we didn't meet anyone coming from the opposite direction! Yikes! Where's the passing lane? Little did we know that, two days later, we would see something like this and be snowed in! In fact, it snowed so much in the Peak District that one of the major roads through the area was closed for at least a week. 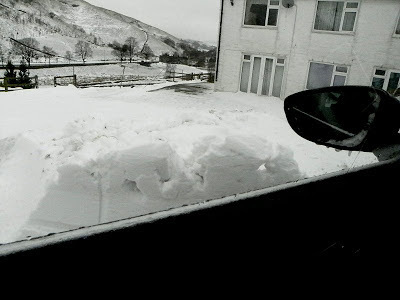 The ferocious winds scoured most of the snow off the hillsides, but the drifts piled high in many places-- like the farm where we were staying. Not too far away from us they found a man who died, buried in a snowdrift, poor soul. 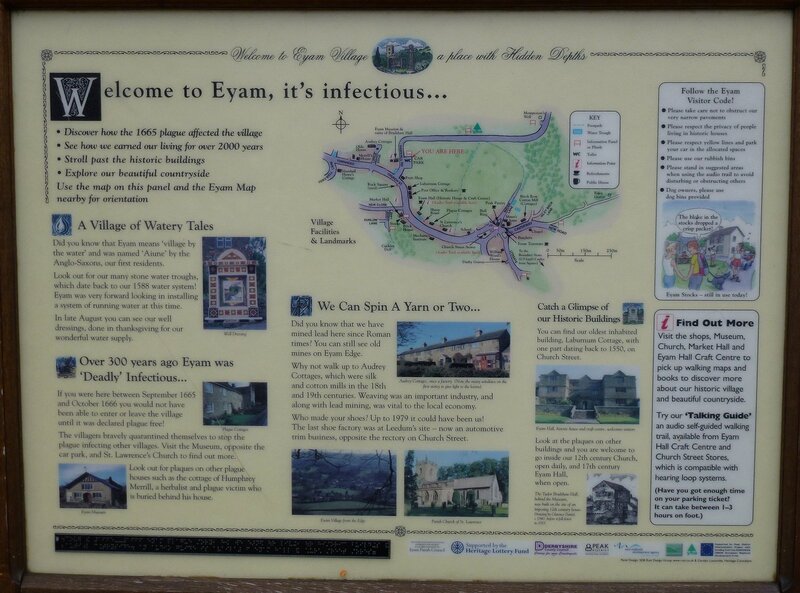 I hope you enjoyed your tour of Eyam. I don't be doing a travelogue next weekend. 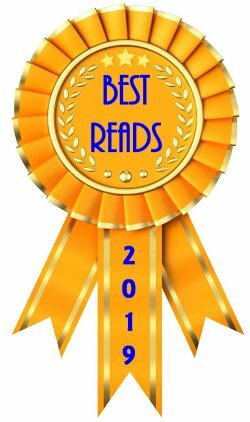 Instead an author will be sharing her views of publicizing books, and my travel tales should resume the following week. Have a great weekend, everyone! Cathy - What a fascinating trip! Thanks for sharing it with us. 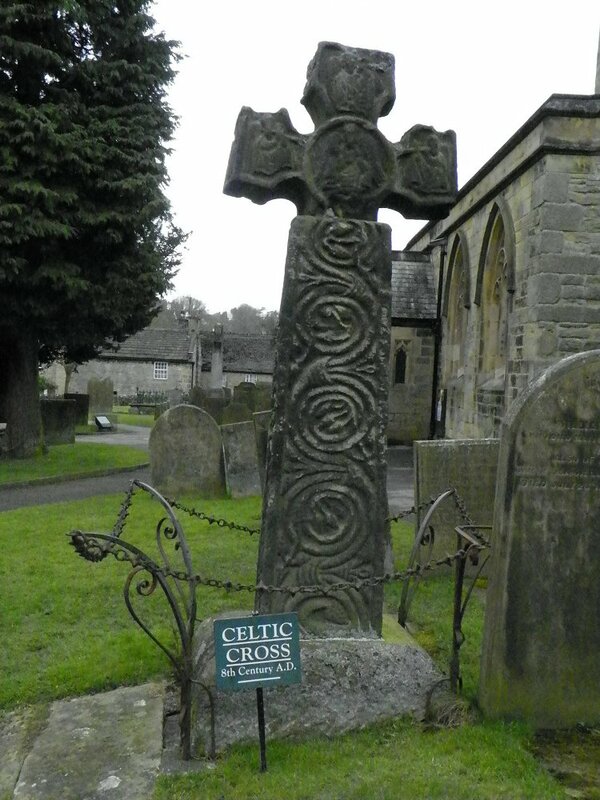 Eyam has so much history I can't blame you one bit for wanting to explore it. I just love the 'photos, too. 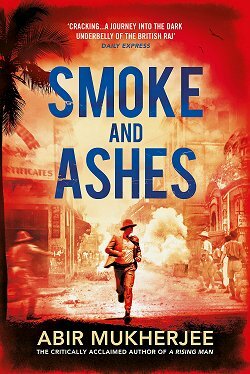 And it's so sobering to think of the death in that village... What a great travelogue. 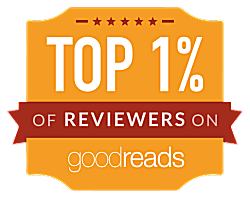 I'm glad you enjoyed it, Margot! 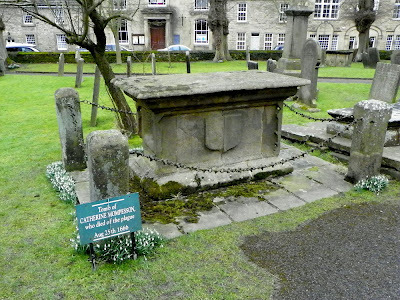 I loved the 'trip' to Eyam! Thanks for sharing. Oh my goodness ... your post and photos are wonderful. Thank you so much for sharing Eyam with us! 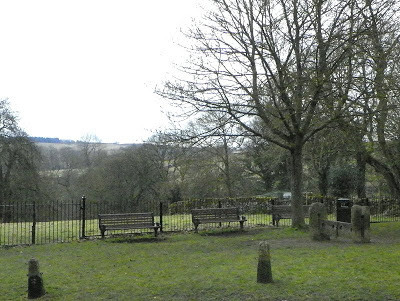 Thanks for your photos of your trip to Eyam. 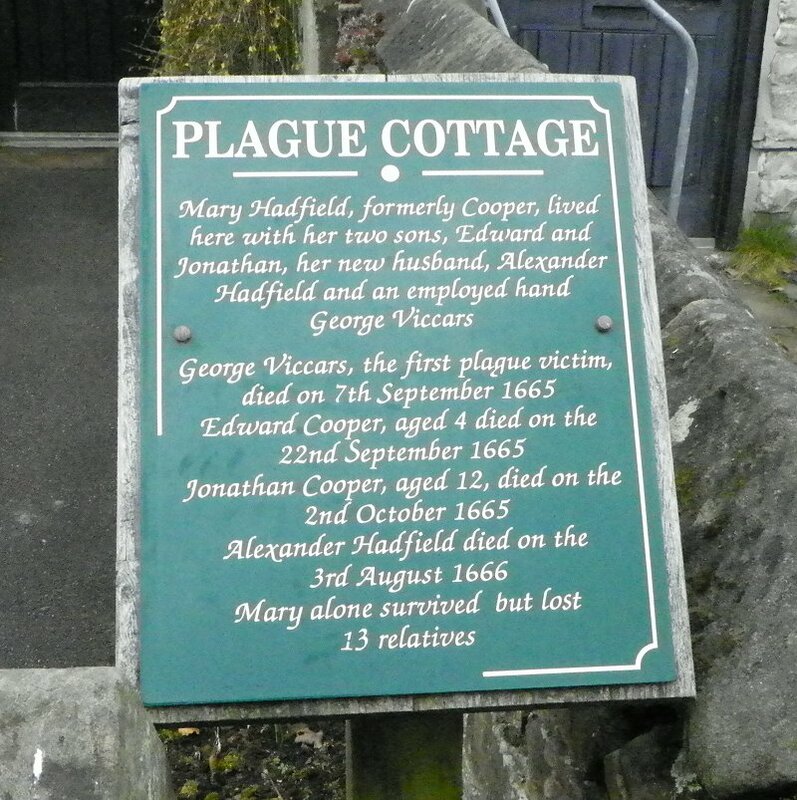 I had not known about this village's plague crisis. 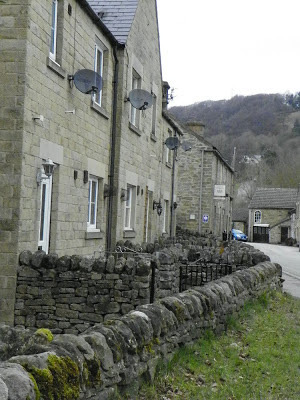 The stone houses are lovely. And so is the old kitchen in Eyam Hall. However, I thank the inventors of electricity, modern stoves, central heating and indoor plumbing! I would have made a poor denizen of the "olden" days. 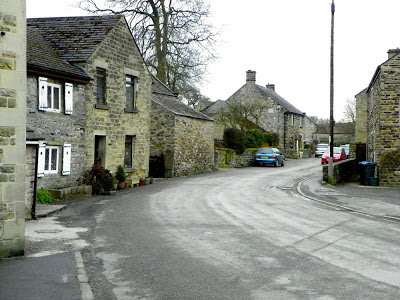 I have just come across this and as I have been married to an 'Eyam' lad for 50 years and lived in the village for a short time, it was lovely to see your photos. 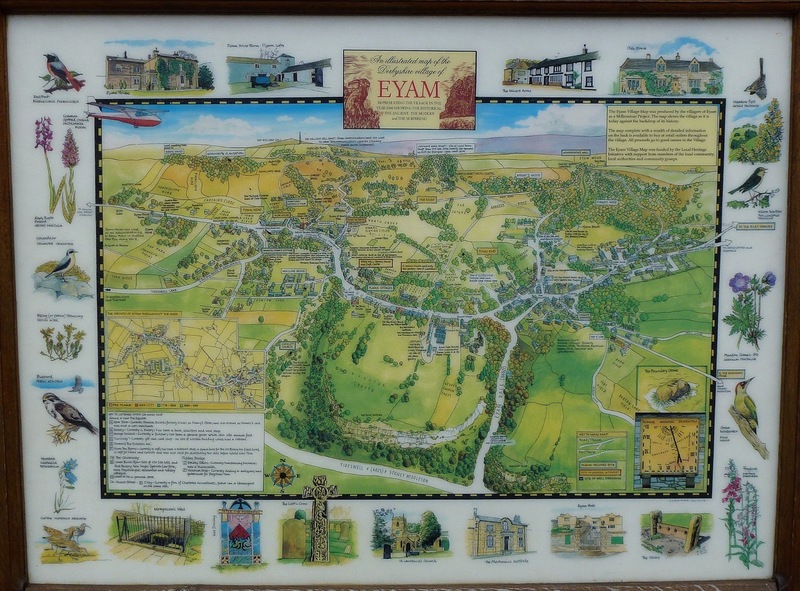 Our connection with Eyam has only finished - family wise - since 2006 when the last Aunt died but we still know lots of folks from there and often go there. 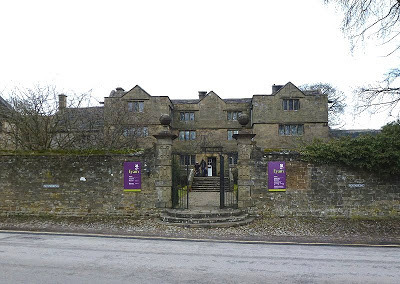 You have done something I never have in all these years and that is visit Eyam Hall. Keep meaning to go and look round but so far never got round to it. So pleased to also knew how to pronounce it, there have been so many weird attempts on TV over the years, one I never realised what it was until I recognised the buildings. I'm so glad you enjoyed my post, Linda. It's a thrill to hear from someone acquainted with the area, so thank you for leaving a comment!